Make sure the version of Parallels Desktop installed on your Mac is compatible with the version of OS X you are running. If it is not compatible, upgrade to the latest version of Parallels Desktop. Update Parallels Desktop to the latest build. In Mac menu click on Parallels Desktop > Check for Updates... Then download and install the update if one is available. If the problem persists, proceed to the next step. Uninstall Parallels Desktop using the instructions in KB124255. 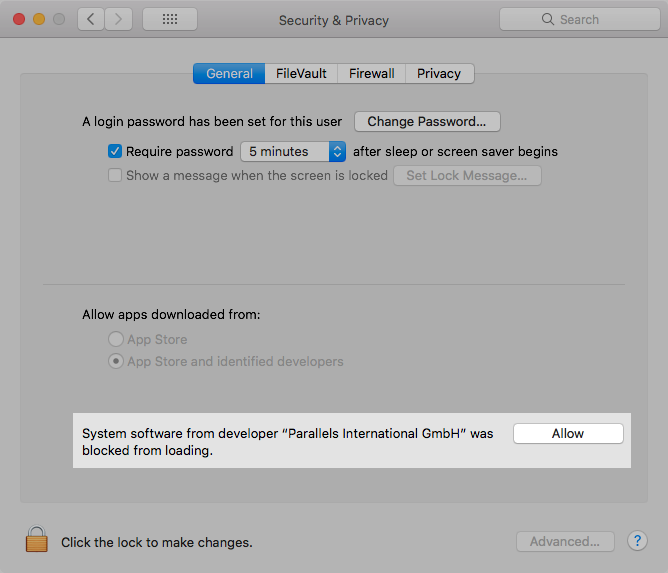 Once Parallels Desktop is uninstalled, reboot your Mac and install Parallels Desktop again. Open Finder > Applications > Utilities > Terminal application. Enter your Mac user account password when prompted, then press Return/Enter. NOTE: You will not see password characters as you type. It is normal Terminal behavior. Just type the password in and press Return/Enter. Restart your Mac, and start your virtual machine.